The link not state or imply that Quintessence Publishing Co, Inc. or Quintessence International endorses, sponsors, or otherwise approves any other site. The link not use any trademarks or logos of Quintessence Publishing or Quintessence International without express written consent from Quintessence Publishing. 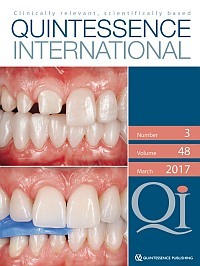 Read the article at the Quintessence International site. In view of the dynamic nature of the Internet and of the possibility of updates and changes, we request that your link enter the Quintessence International site at the home page. If you choose to link to an internal page, we cannot guarantee that the link will remain active. You must abide by all of the other terms and conditions of use listed above. For example, you may not reproduce or host content from Quintessence International on your web site.